Vintage Realty Byford principal Jenny Bosma said that in October she understood she could move her business, including sign, to a South West Highway building she spent $460,000 to buy and $150,000 to renovate. She is considering legal action after getting an infringement notice from Serpentine Jarrahdale Shire the day after erecting the sign. 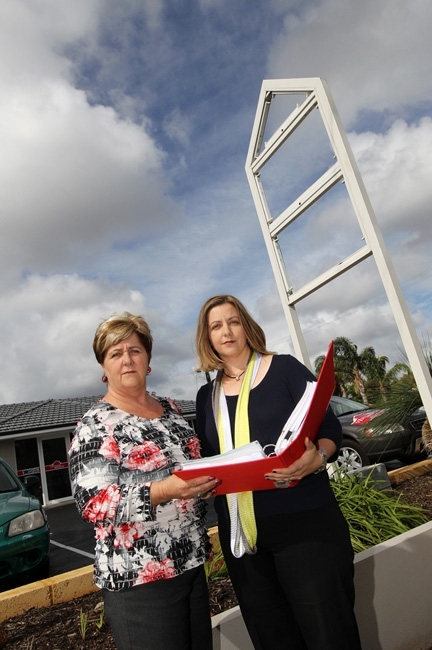 Ms Bosma said she now understood she could not have any external sign at all ” despite Byford Healing Arts next door having a large one on its front lawn, and businesses across the road having the same. ‘From a business point of view, this is absolutely terrible,’ she said. ‘This is like playing with children, there’s no foresight. Shire president Bruce Moore said during the assessment process, the Shire advised the applicant any future signage would need to comply with planning policy. ‘The signage matter was discussed with the applicant at the time of seeking approval for change of use at the site,’ he said. He did not comment on the difference between her sign and the surrounding businesses’, saying only that this was not relevant to the application in question. He said the Shire supported its business community and acknowledged signage was an important part of commercial activity, but said development had to be assessed, on its merits, against policy. ‘The proponent or any other concerned community members are welcome to lodge a formal complaint, seeking clarification as to whether a sign has development approval,’ he said.